HomeNewsHonda HR-V facelift unveiled in Japan, Honda Sensing standard on all variants! Honda HR-V facelift unveiled in Japan, Honda Sensing standard on all variants! 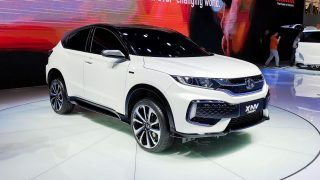 Honda has given its popular B-segment SUV, the Honda HR-V a mid-life facelift after five years in service. Also known as the Vezel in its home market, the HR-V gets new LED headlamps, more kit and Honda Sensing safety suite as standard across the board. 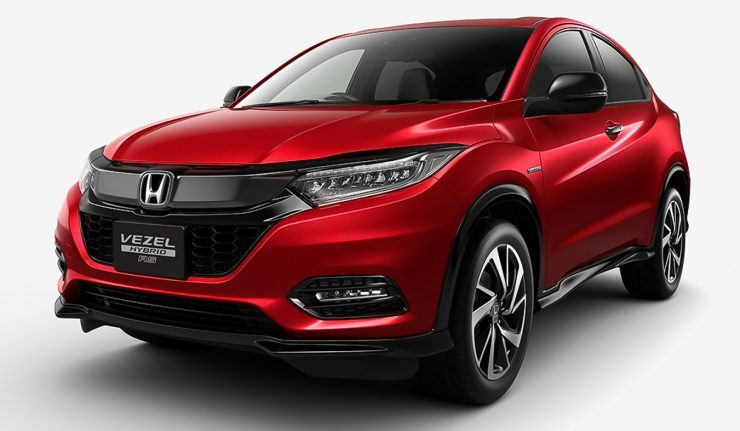 New items on the refreshed HR-V include a redesigned front grille, new front bumper with integrated LED fog lamps and full LED headlamps (reflector type). The range-topping RS model gets a sportier treatment in the shape of blacked out grille, aggressive body kit, wing mirror caps in black and 18-inch dual-tone alloy wheels. Customers can also choose two additional colour palettes –Aurora Amethyst Metallic and Silver Mist Green Metallic, bringing the total number of colour to eight. Inside, the HR-V benefits from reshaped front seats with new stitching material to “improve hold ability and texture”. Selected models also get eight-way powered driver seat with memory function. Apple CarPlay and Android Auto are also standard fitment on more expensive variants. To improve the HR-V’s overall ride comfort, Honda has fitted additional damping material for lower NVH levels (Noise, Vibration, Harshness) and a restructured high-pressure fuel pump for suppressed engine noise during acceleration. There are two powertrain options available – 1.5-litre four-cylinder i-VTEC petrol and 1.5-litre i-DCD Sport Hybrid. The petrol mill is still mated to a CVT transmission while the Sport Hybrid variants get a seven-speed dual-clutch with paddle shifters. Front- and all-wheel drive are available on all variants, but the RS models can only be had in FWD guise. Honda has also fine-tuned the Sport Hybrid i-DCD system for smoother acceleration and optimised the brake pedals for a more natural brake feel. All variants of the HR-V in Japan come with Honda Sensing advanced driver assist system as standard which bundles functions such as Lane Keeping Assist System (LKAS), Adaptive Cruise Control (ACC), Forward Collision Warning (FCW), Collision Mitigating Braking System CMBS), Lane Departure Warning (LDW) and Road Departure Mitigation (RDM). Prices for the facelifted Honda HR-V in Japan starts from ¥2.07 million (RM76k) to ¥2.9 million (RM106k) for the Sport Hybrid 4WD. The petrol variants of the HR-V will no doubt make its way to Malaysia very soon and noting that Malaysia is the only country outside of Japan to assemble Sport Hybrid i-DCD models, we may finally get a hybrid-powered HR-V.
Video: When was the last time you checked your car’s tyres? BMW Concept 8 Series on display in Kuala Lumpur, like how it looks?